The last diesel locomotive rolled off the Alco assembly line in 1969 but the hills of northwest Arkansas still echoed those distinctive Alco sounds in 1988, when Pentrex set out to bring you an up close and personal look at the people, places, and equipment of the Arkansas & Missouri Railroad. Running along a 139-mile corridor from Fort Smith, Arkansas to Monett, Missouri, the A&M is a longtime favorite of railfans as its fleet is comprised entirely of Alco locomotives. Here'syour opportunity to see Century 420s climbing the steep slopes of the Boston Mountains, the highest mountain grade between the Appalachians and the Rockies. You ll thrill to those unmistakable throaty sounds of an Alco throttle yanked into Run Eight. You ll also ride in the cab of a smoking T-6 as it switches cars on a branch line and visit the shops in Springdale where the locomotives are serviced and kept running strong. A highlight of your adventures is a ride aboard RS-1 #22 as it pulls a passenger train just for us. 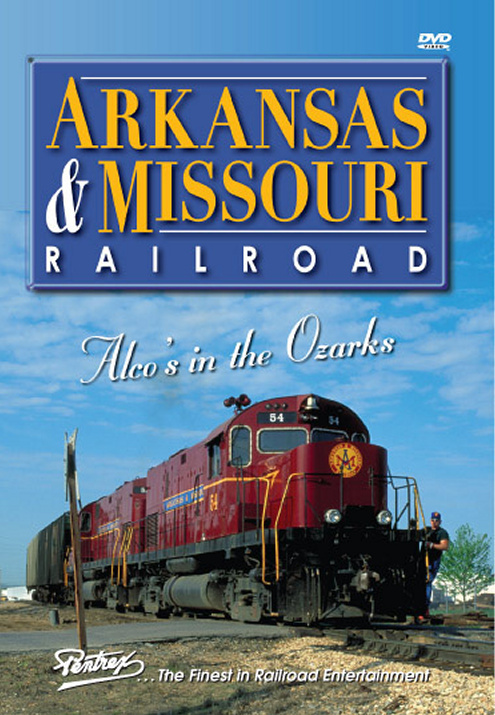 This entertaining tour of the Arkansas & Missouri is a must-have addition to your railroad DVD collection! This dvd is the way I like it to be done. This an exciting intrusion in the A&M RR. Most of the shots are taken from running engine i.e. in cab, on the sidewalk and foot plate. You feel like you are a crew member of this RR. Any alcophile will be 100% satisfied.The visit to the maintenance shop is a great asset (these are very rare scenes especially for alco).I also liked the scene where two employees explain how they communicated together when they did not use radio. This dvd is in the top five of my personal RR dvd collection. Don't miss this one ! Charles B (Cairo, GA) on 2015-02-09 20:49:25. Another excellent production by the Pentrex team. You feel like part of the staff on the Arkansas & Missouri while watching this DVD. Pentrex does an awesome job explaining the various operations on the A&M. You get to ride in the cab, see the A&M shops, and listen to the people who make the A&M work. Did I mention the ALCOs and beautiful scenery? It's all here in this top notch video; you won't regret getting this DVD. chris collins (fletcher north carolina) on 2014-06-24 18:45:13.